FujiFilm Medical Systems USA, Inc., unveiled the first long-length digital radiography (DR) detector—the new FDR D-EVO GL DR detector for single exposure long-length digital imaging. 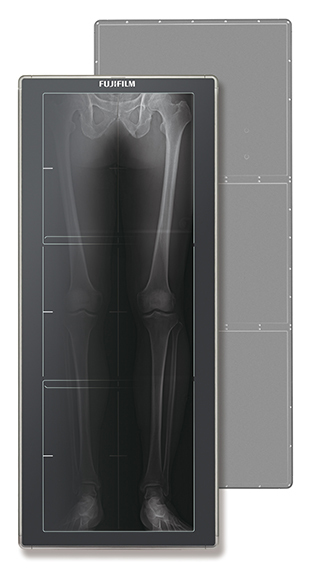 With a 17 x 49 inch field of view, Rob Fabrizio, director of marketing and product development, Digital x-ray and Women’s Health, FUJIFILM Medical Systems U.S.A., Inc., says “the detector enables technologists to efficiently acquire challenging long-length exams using low dose DR technology” and can provide 40-50% dose reduction compared to CR. Due to the single exposure, full length images can be captured in as little two seconds while decreasing the chance of patient movement that can occur between exposures. The FDR D-EVO GL complements its single exposure acquisition with ISS technology and noise reduction circuitry to uniquely contribute to producing clear, sharp images at a low dose. FujiFilm Sonosite introduced iViz, an ultrasound solution geared for mobile use and telemedicine that combines imaging with health IT to enable patient assessment in non-traditional environments. In addition to providing ultrasound, the medical Android OS tablet offers bi-directional communication with the EMR enabled through Synapse VNA so clinicians can access patient information and demographics, as well as other unique communications capabilities including access to cloud-based storage, PACS, and the ability to email encrypted and de-identified patient reports. iViz also provides 12-lead ECG capability, front and rear facing cameras, and a USB port. Since iViz is also a tablet, clinicians can consult with other providers for near real-time assessment. The platform can also integrate future point-of-care diagnostics and sensors and these tools are developed. RSNA 2015: Long-length DR detector, point-of-care ultrasound . Appl Radiol.